More and more employers are banning cell phones in the workplace because they are distracting enough to be a serious safety issue for workers. Most notably, General Motors has banned all employees, including its CEO, from walking around with their mobile phones while talking, texting or using other smartphone functions. You already know the dangers of using your phone while behind the wheel, as vehicular deaths have spiked since the ubiquity of smartphones. But in many workplaces – think warehouses, construction sites, factories and other worksites with equipment and inventory – the distraction of a smartphone can have deadly consequences. On top of that, they are “productivity killers,” as a report called them after finding that 75% of employers surveyed said that at least two hours a day were lost to distractions like texting and the Internet. OSHA bars the use of cell phones in construction regulations pertaining to cranes and derricks, but the hazard exists across any dangerous equipment. Some workers should absolutely not have their mobile phones on and within reach, such as powered industrial truck operators, forklift drivers and machinery users. If you have any of these among your workforce, you should strictly ban the use of mobile phones in any capacity during the use of industrial equipment. You may consider extending the ban to include all of the other employees who regularly work around that equipment, particularly when they are walking or moving product to and from the warehouse. Also, if any staff from your office are in the work area, they too should refrain from using their phones while walking. One of the main points that employers try to drive home is that the best way to prevent workplace injuries is for all employees to be aware of their surroundings. When people are using cell phones in an operational environment, it impedes their ability to recognize and react to hazards, particularly moving equipment like forklifts. The biggest concern is people who are in the middle of writing long messages and engaging with others on social media or texting. Many of these apps have been shown to greatly reduce the user’s awareness of the real world around them. There are many instances in which workers cause traumatic injuries or even death to themselves or others due to cell phone distractions that could have easily been prevented. Distracted cell phone usage is known to cause workers to accidentally misuse equipment or machinery, which can result in either small or serious damage to company property. Also, having a cell phone around hazardous chemicals or waste can pose a serious threat to the health and safety of all workers in the vicinity, in addition to property damage. Furthermore, the cost of replacing damaged property can have a major financial impact on your organization and possibly be at your expense. 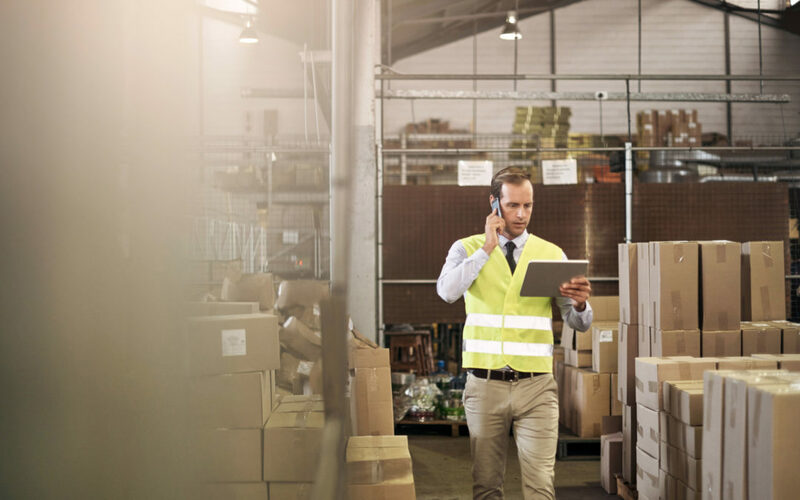 Cell phone usage can have adverse effects on warehouse production levels and the individual performance of your employees. People who are on their phones could be working instead and, if someone is involved in social media banter or watching an amusing video on YouTube, it’s easy for them to ignore important matters that come across their desks. Employers that have not put policies in place – and even workers – might not realize how much social media and smartphone use can hurt productivity. Create a policy that explicitly explains when and where employees may use their mobile phones while on the job. Some companies ban cell phones altogether, particularly call centers where employees’ devices are collected at the beginning of the day and kept in lockers until breaks. Mobile phones are barred for employees when performing on-site job-related tasks. Answering calls, texting, checking social media or using the Internet are all activities that fall under dangerous cell phone usage. Set parameters for when and where employees are allowed to use their phones. Consider restricting types of media and videos. Hold employees accountable to productivity levels. Note that time spent on the phone on personal matters is keeping them from focusing on their jobs.